While perusing the blogosphere recently, I came across Suganthi Mohan's post about a kolam that she quilled. It seemed a perfect follow-up to Friday's snowflake post as the look is similar, but wait... just what is a kolam? Suganthi explains it's a time-honored tradition in southern India. Each morning, women draw beautiful kolams in front of their houses with ground, white stone powder or rice powder. The designs are considered to be a good omen, bringing prosperity to the home. During festivals, large, colorful kolams, called rangoli, add to the celebration. Here's a mesmerizing, little video of a simple kolam in the making... this one is not a colorful design though, so I'm not sure why it's labeled rangoli, but you'll get to see the technique. No doubt it takes a great deal of practice to work this smoothly. Suganthi says, "We have freehand kolams which have lots of swirls and curls, and then there is the dotted kolam where dots are placed on the ground according to a particular count and design, and kolams are drawn, joining those dots." (If you'd like to learn more, this is a good link about kolams.) Her quilled design was inspired by one found in a book of patterns, and she used heavy paper so it's quite sturdy. You might enjoy checking out Suganthi's blog to see more of her geometric, quilled designs, as well as a multiple loop tutorial for a neat looping technique that uses different colors. By the way, Alena has added a paper lotus tutorial for the one that was shown in a post last week about her blog, Bells In Spires. I can picture a set of these as beautiful place cards. Depending on the type of paper, a name could be lettered on a leaf or petal, or a little tag could be placed on a stick in the center of the flower. Ann, Thanks for the feature on Suganthi, the filigree shapes in the Kolam are just gorgeous. What really appeals to me is how the filigree ends are more open. I loved her website too! Thank you Ann, for featuring my kolam. So beautiful to watch them drawn. Thanks for sharing! These are amazing and so different. I find it really fascinating how paper can make such different things - from delicate flowers and quilled pieces to books. Thanks for finding this wonderful example for us! That video was fascinating. She made that look so easy. The kolam that you featured is beautiful. i've got to go read more about that. That was beautiful and inspiring! And I also learned something new. Thank you for a terrific post. all ur quilling works r excellent. hi Ann! 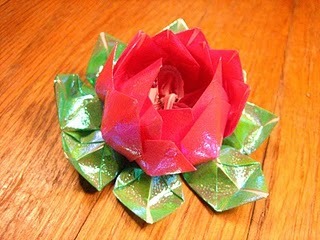 thanks for the link to my paper lotuses (lotusi? lotusis?)! i LOVE the powder kolams, they so beautiful. Kolam or rangoli, I love the intricate patterns created. All that hard work deserves lots of good luck. Very nice designs! We also call them as sankranthi muggulu with chukkalu in Telugu, as we celebrate this day as the festival of Harvest.